August is National Inventors Month. The United Inventors Association of the USA, the Academy of Applied Science, and Inventor’s Digest Magazine started this celebration in 1998. The purpose of this month is to celebrate creativity and innovation. 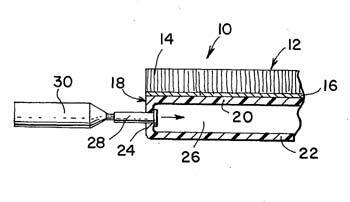 Some of the most imaginative patents granted have not been for products that most would consider practical but they all celebrate the spirit of invention. 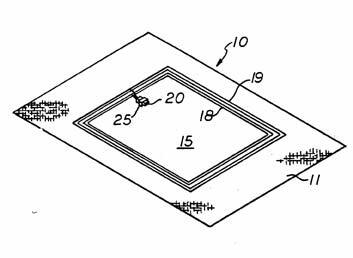 From the Electrified Table Cloth to Inflatable Rug, these are some of the most interesting and possibly useless patents granted. Patent #3,984,595 was issued October 5, 1976 for an Inflatable Rug. A rug which is convertible to an air mattress includes a rug member adhesively laminated on top of a flexible-walled backing member composed of a pair of stacked sheets sealably joined around their margins. Patent #5,107,620 was issued April 28, 1992 for an Electrified Table Cloth. An electrified table cloth for preventing crawling insects from gaining access to the consumer’s food or drink comprises a cloth formed of electrically insulated material which has at least one pair of parallel electrically conductive strips secured to the edge or border of the cloth to completely encircle the cloth and which are connected to a low voltage DC battery also secured to the cloth. 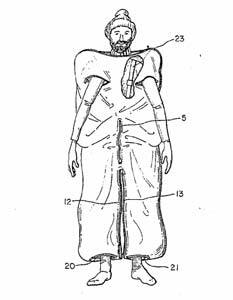 Patent #4,507,805 was issued April 2, 1985 for an Ambulatory Sleeping Bag. A convertible sleeping bag for use as a sleeping bag and an ambulatory garment having integral upper torso and lower torso portions, the upper torso portion having a front and back and at least two closeable openings…. 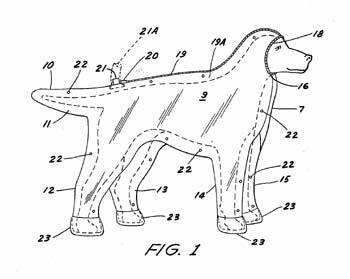 Patent #3,150,641 was issued September 4, 1960 for a Dust Cover for Dogs. This invention related to domestic pets and has particular reference to the care and well-being of dogs and cats. It is well-known to animal lovers that dogs and cats harbor fleas and other pest and that the attempt to eradicate such pest oftentimes poses quite a problem. Efficient powders and sprays are not on the marking for eliminating these pests, but their effective application and retention leaves much to be desired. It is therefore an object of this invention to provide a device, which will greatly assist the animal owner, in the effective application and retention of such pesticides on the animal, for a period of time sufficient to do the work required. Patent #6,557,994 was issued on May 6, 2003 for Frameless Glasses Attaching To Body Piercing Studs. A frameless glassware assembly attaching to body piercing studs. Design consisting of an elastomeric C-clip fixedly attached to one distal end of a metal arm, which is attached to a frameless glass lens assembly. Design allows for frameless eyeglass attachment to the eyebrow studs or to the nose studs of a user via the elastomeric C-clip. One embodiment allows the frameless glassware to attach to eyebrow studs and the second allows the frameless glassware to attach to a nose stud. Both designs are frameless and avoid side wire earpieces common to hold glassware to the face of a user. ← Ask The Invention Geek – Presidental Patents?